RebKell's Junkie Boards :: View topic - Damn, Ben, swat his shot! Damn, Ben, swat his shot! 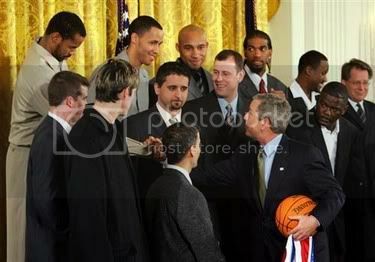 To say that Rasheed Wallace is less than thrilled to be meeting President George W. Bush on Monday is an understatement. When asked about the Pistons' trip to the White House, Wallace said, "I ain't going to say (nothing) to him. I didn't vote for him. I'm not excited at all, it's just part of the thing." "He ain't lying, either," Billups said. "He won't say nothing to him."